If you’ve researched water filter systems for your home, then you are probably familiar with reverse osmosis. For those of you who are not familiar, reverse osmosis is commonly described as the most complete way to filter your water. In some ways, this statement is valid. Reverse osmosis uses a membrane to very finely remove almost all dissolved solids from tap water. This sounds like a great system, right? After all, the point of water filtration is to take out all of the bad substances and leave us with safe water. To get truly safe and healthy water, it’s very important to consider the adverse effects of drinking water that has no beneficial constituents. The World Health Organization released a report summarizing some eye-opening findings about reverse osmosis and the “demineralized” water it creates. 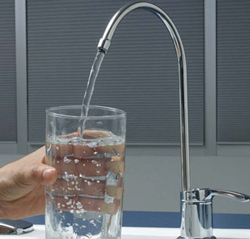 Below are 5 reasons from the report that reveal why reverse osmosis is bad for your health. Water is the universal solvent. When it is demineralized – or run through a reverse osmosis system – it aggressively seeks new metals and minerals to leach and absorb. This becomes a problem when you RO water – it leaches beneficial minerals such as calcium and magnesium from your body. Studies from around the world over a fifty-year period agree that water low in calcium and magnesium leads to a higher rate of bone fractures, cardiovascular disease, pregnancy disorders and some cancers. This might sound obvious – of course drinking water results in more trips to the restroom – but it’s more complicated than that. Reverse osmosis water throws off water homeostasis in the body, causing a 20% increase in diuresis (aka need to urinate). Most reverse osmosis companies will advise you to use your demineralized water for cooking. While cooking with the right water can make a significant difference, this is NOT the case for reverse osmosis. The study explains that cooking with demineralized water actually removes about 60% of the beneficial minerals from your food. Since the majority of our nutrients come from what we eat, cooking with demineralized water can be very detrimental to your dietary health. Just as reverse osmosis water is likely to absorb minerals in your body, it is also highly aggressive to materials with which it comes into contact before entering your body. It readily dissolves metals and organic substances from your sink’s pipes, coatings, storage tanks, hose lines and fittings before entering your glass. Low-mineral water intensifies the leaching process, raising your chances of getting lead poisoning from your kitchen’s plumbing. The report explains that since demineralized water throws off homeostasis in the body, it leads to more thirst. What’s wrong with a little additional thirst? It means more of all the problems listed above. Welcome to the vicious cycle of reverse osmosis. It’s important to look for a Drinking Water System that reintroduces healthy trace minerals to your water, in addition to removing harmful contaminants. The Aura H2O Water Filter not only removes 99.9% of contaminants, but also adds minerals such as calcium and magnesium back to your water. Also, the Evolution Healthworks system wastes no water, compared to the average reverse osmosis system that wastes about 5 gallons for every 1 it filters. This entry was posted in Blog, Contaminants, cooking, Diet, Drinking Water, Metal, Reverse Osmosis, Tap Water, Water Filter, Water for beauty, water for health and tagged calcium, demineralized water, low mineral water, magnesium, mineral water, osmosis, osmosis reverse, remineralized water, reverse osmosis, reverse osmosis bad, reverse osmosis bad for health, ro, ro system, ro water, total dissolved solids on September 15, 2014 by Adam.